Kiev: Saint Sophia Cathedral and Related Monastic Buildings, the Kiev-Pechersk Lavra consists of a group of monuments known for their art, architecture and the spread of the Orthodox faith. Kiev's Saint Sophia Cathedral was designed to rival the Saint Sophia of Constantinople. Prince Yaroslav the Wise built it to commemorate the victory over the Pechenegs (Asian nomadic tribes) and to glorify Christianity. From here the Orthodox religion spread over the larger Russian world. The cathedral was built in 1037, and still stands proudly in the old city center. It is open to visitors, and services are held. 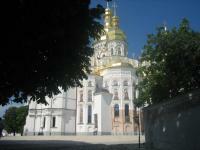 Besides the Cathedral, also the Lavra Monastery is part of the World Heritage. The monastery dates from the 16th century, and consists mainly of catacombs under the ground. I missed the spectacular interior of this cathedral, but I still have fond memories of Kiev. The atmosphere, the old houses and streets: life seemed to be so much more sunny than in the Russian cities Moscow and St. Petersburg that I had visited before. Even the food was better! I have been to Kiev many times in my childhood, but those visits never included any sightseeing. Decades later, I found myself in Kiev on a business trip. It was January of 2014, in a period of relative calm of the Maidan revolution before its final eruption. The city did not feel unstable or dangerous to navigate, so on my only free day I spent time exploring some of the city major sights, including both parts of the WH site. Inscribed for the spiritual and intellectual influence these religious complexes had on the "Russian world" in 17th-19th centuries, Saint-Sophia Cathedral and Kiev-Pechersk Lavra are on the most basic level fascinating architectural monuments with history going back nearly a thousand years. Seeing these close up is highly recommended if you are in town. This is not a single site, but two distinct compounds that both date back to the 11th century. The great church of Saint-Sophia assumed its current form by 1767, along with the cluster of buildings surrounding it. The Lavra also underwent significant expansion in 16th-17th centuries, although some of its original caves remain and are accessible for a visit. Both sites are located in the central part of Kiev, well served by public transportation (although not within walking distance of one another). At the time of my visit, general entry was free, but interior access for non-worship purposes required tickets. Saint-Sophia Cathedral could only be visited with a guide. A walking tour of the Lavra included interior exploration of a single church, that of All Saints. Photography is limited inside most of the buildings. It should be noted that there are many other marvellous points of interest in the city of Kiev, no less interesting for the fact that they are not recognized as UNESCO sites. 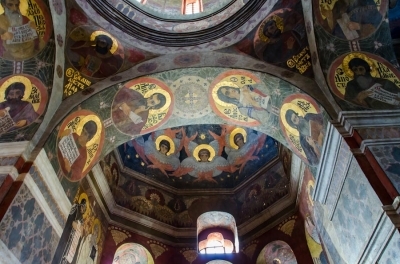 St Michael's and St Volodymir cathedrals are just two obvious examples. This was my first real experience of an eastern orthodox cathedral and the interior of St Sophia’s cathedral certainly didn’t disappoint. I wasn’t quite expecting to see such a beautiful set of frescos. I found myself wandering from arch to arch staring up and marvelling at the next new impressive sight. I spent quite some time wandering around the interior, losing my travelling companion only to be reunited with broad grins across our faces; neither of us was really expecting a site of this quality. The rest of the precinct of St Sophia’s was reasonably nice but not especially interesting. A day later we visited the Lavra Monastery a little further to the south of the centre. This is a much larger complex and is still an active site of pilgrimage. The upper part of the Monastery was fairly busy, the Bell Tower was closed for renovations so we headed into the Cathedral, and this has been mostly rebuilt and was only mildly interesting inside. The highlight of the Upper Part was the Refectory Church, which had a magnificent interior, really showing the Byzantine heritage of the architecture of the buildings. We then proceeded down to the lower part of the monastery, taking in the wonderful views over the Dnieper flowing through the centre of Kiev. The Lower part of the complex is the focal point for pilgrims as this contains the caves for which the site is famous. All are welcome to enter some of the caves to view the mummified bodies of saints, though there are requests posted to ask that certain areas be reserved for Pilgrims and prayer only. There is no light in the Caves and the only way to navigate around is by buying a beeswax candle to light the way. This actually leads to quite a sensory load. There is the almost total darkness, the chill of the caves, the heat and smell from the melting beeswax, it makes visiting this WHS quite a unique experience. Altogether I was very impressed with Kiev, it is a big, bustling city reminding me of places like Barcelona and Milan. There were lots of tree lined boulevards with cafe’s spilling out into them. The roads are busy and there are a multitude of grand buildings. It is not the sort of place that you could get a full grip on in a few days and I think repeat visits would be greatly rewarded. The WHS itself is truly brilliant the architecture and internal decoration were simply fantastic. A real favourite site from the list. Kiev proved to be quite a surprise for me. But it was not the first time I travelled to former Eastern European countries in order to find that it’s not all concrete, Stalin-architecture and generally miserable. Same thing happened again in Kiev, a town that turned out to be a relaxed place, with beautiful buildings where even the post-Stalin architecture blends in well. A city filled with nice restaurants, cafés, incredible parks, good shopping and - of course - the magnificent churches and monasteries of Kiev-Pechersk Lavra and Santa Sophia Cathedral, the World Heritage Site of Kiev. The monasteries and churches are really the landmark of Kiev and someone said that there are over 200 churches in this orthodox “junction” of Slavic Europe. 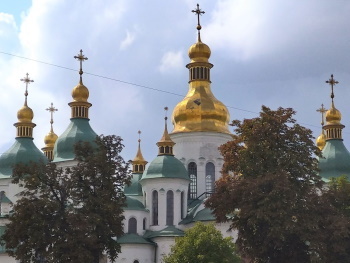 To even further grasp the religious history I took a trip to Tchernigov, some 170 km north of Kiev, today a small town of northern Ukraine but once a religious centre with some of the oldest churches and monasteries in the country. Even one of the monasteries is located complete underground. Tchernigov is also found on the tentative list and might become a real World Heritage Site one day, which it well deserves. 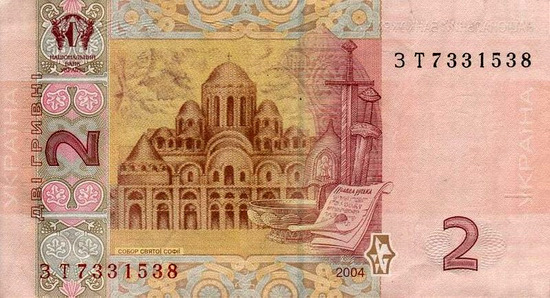 I lived in Ukraine for a couple of years, and visited Saint Sophia a number of times. I always found it a beautiful cathedral, and along with the grounds was always a spectacular visit. These visits became more significant to me when my father, an avid geneologist, found out that one of our ancestors was Yaroslav the Wise, who built the cathedral and is buried in a sarcophagus there. 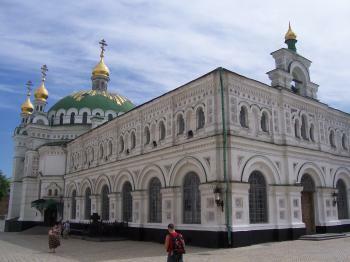 I highly recommend a visit to Saint Sophia Cathedral on your next visit to Kiev. In fact, it's so good that My Wife and I are considering re-marrying (without a divorce) in Saint Sophia's. If you are going to get married in Kiev (and why not) then Saint Sophia's is the place to do it. Holy Tunic: Fragments of the Robe were held in St Sophia cathedral. There is no mention of them being there today.